Contrary to the slightly sceptical tone I’ve adopted in this piece for the Telegraph, I actually have a huge soft spot for World Book Day and the pressure it brings to create wondrous costumes for your primary-school aged children. I like forcing myself to find literary reasons for whatever we’ve dragged out of the dressing-up drawer and I’m in fav our of anything that encourages, even tangentially, reading for children. That said, I had fun writing the piece for the Telegraph because I agree with the central tenet – don’t think of a character and then find the costume, but instead think of a character to match the costume. 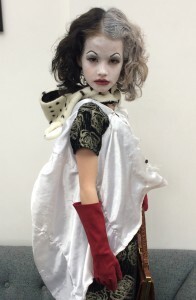 For example, we were given a cute toddlers’ Dalmatian costume years ago – my daughter has cunningly repurposed it as a fur hood as Cruella de Vil. On the back of that article, I was interviewed on Radio Five Live. I think my children were somewhat surprised that I had become some sort of multi-media World Book Day expert, especially since one of them was insisting I’d got the day wrong. I have no idea how it went other than the presenters were lovely and one of them has a BFG-costume wearing son called Ben. Hope he and his papier mache pipe were a roaring success.